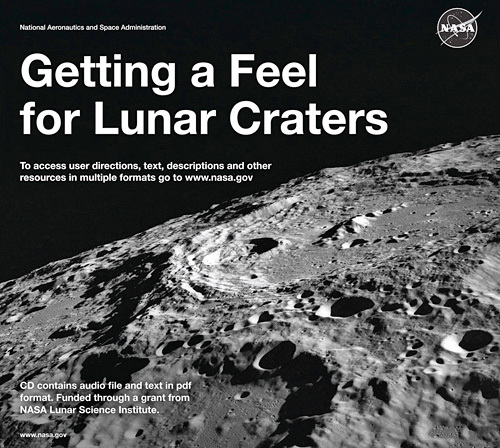 NASA's 'Getting A Feel For Lunar Craters' Book Features Tactile Diagrams Of The Moon For The Visually Impaired | OhGizmo! By Andrew Liszewski on 08/05/11 • Leave a comment! After a visually impaired student signed up for one of professor David Hurd’s introductory astronomy courses at the Edinboro University of Pennsylvania, he started creating tactile astronomy tools so they could partly experience what celestial objects were like. And his latest effort, a new book called Getting A Feel For Lunar Craters, allows the blind and visually impaired to experience the surface of the Earth’s moon with tactile diagrams and braille descriptions that lets readers feel the various craters, crags and other landmarks that dot its surface. The 17 page book was created by David with assistance from the NASA Lunar Science Institute, and as far as I can tell is available for free from NASA’s website, though you’ll have to wait for the second reprinting of the book which will be ready in a couple of months. In the meantime though, text-only and audio file versions of the book can be downloaded from their site, if you’re curious.